F.I. Woodward and T.M. Smith, Global Photosynthesis and Stomatal Conductance: Modelling the Controls by Soil and Climate. R.G. Ratcliffe, In vivo NMR Studies of Higher Plants and Algae. H. van den Ende, Vegetative and Gametic Development in the Green Alga Chlamydomonas. W.S. Pierpoint, Salicylic Acid and its Derivatives in Plants: Medicines, Metabolites, and Messenger Molecules. Author Index. Subject Index. 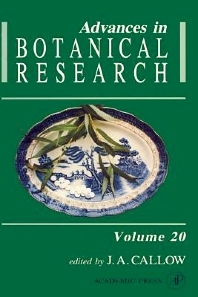 The twentieth volume in the series offers articles of interest to a broad range of plant scientists. These vary from consideration of the relationship between vegetation and climate to the biochemistry and uses of commonly used plant metabolites. Woodward and Smith discuss the development of dynamic and mechanistic models to overcome some of the limitations of current, essentially static, approaches to the effect of climate change on natural vegetation and crops. The chapter by Ratcliffe studies the use made of various NMR techniques in the study of physiological and other problems in plants. Van den Ende's article deals with the use of Chlamydomonas, a typical unicellular algal system, for the study of organelle development and the controlling mechanisms involved, in both its vegetative cell cycle and in gametogenesis. The natural roles and basic biochemistry of commonly used plant metabolites are often almost completely misunderstood. The last chapter by Pierpoint looks at an example of these, the salicylates, which are of great importance in medical research and for their medicinal value. Following a summary of the historical background to their study and use, the author considers recent progress towards understanding their biosynthesis and natural roles in the context of their better-understood pharmacological actions in animals. Plant scientists generally from postgraduate to senior academic.